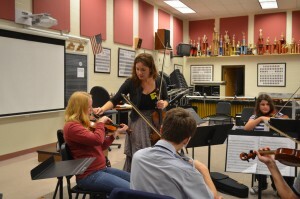 Symphony@School (S@S) is an intensive, in-school residency program offered by the Richmond Symphony String Quartet to middle and high school programs. Residencies include the following components: planning with orchestra directors and school administrators, in-school performances by the RSO String Quartet, sectional coaching with RSO musicians and rehearsals with RSO conductors. Additionally, students, teachers, and their families will be invited to an upcoming concert as guests of the Richmond Symphony. Each residency will occur over a time period of approximately one month. There will be no cost to the school for a residency, but there may be costs associated with student transportation that will be the responsibility of schools and/or students. Host schools should be prepared to support each residency by providing adequate space, logistical support, and by supporting students’ attendance at a RSO concert (tickets provided by RSO). For more information, or if you are interested in bringing the musicians of the Richmond Symphony to your school, please contact Aimee Halbruner at ahalbruner (at) richmondsymphony.com.